Go Big Read: NOW on PBS: Food, Inc. Behind the food we love—Secrets that giant food companies don't want you to know. NOW on PBS: Food, Inc. Behind the food we love—Secrets that giant food companies don't want you to know. 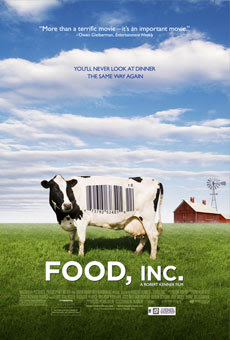 During the week of 3.5.10, PBS’s television program, NOW, recently aired an episode focusing on the new documentary film, FOOD INC (which features Michael Pollan, author of this year's Go Big Read book selection). Brancaccio questioned Kenner about the cost of fresh produce and other healthy foods in the midst of such a widespread recession. Kenner acknowledged that fast food is quick, readily available, and many people are unaware of the damage those foods do to our bodies. However, what they don’t realize is that the cheapness of these foods is costing them much more in medical bills because of the affects these processed foods can have on the human body. Kenner argues that the major food corporations are creating food that makes lower income people sick because the government is subsidizing unhealthy foods to make them cheaper and therefore more appealing to the nation's poor. This film is very informative...and true. Unfortunately, the corporations that our feeding our nation seem more concerned with making money than with feeding the population safely. I found this film groundbreaking and the technical production was top-notch for a documentary. Ok, i think there are no people on this planet unaware of the damage fast food does to our bodies and still millions of us eat from these places. That's really strange. I think it's more of a habit, marketing of the big fast food companies and lobbies. However, if we want to eat normal and healthy food that isn't that hard. There are millions of articles and posts online which explain how we should eat. This article http://goo.gl/uGMo29 is just one of many but it defines best my understanding of healthy eating - lots of veggies, fruits and water. That's my mantra. Hopefully, more people will find similar info and will think twice before getting a double next time . Great blog and so sad to think that we in the richest countries throw away enough food to many and and die from diseases caused by unhealthy eating.